offers a new case design and a new set of capabilities. You may not realize it, but your home theater equipment could be in peril. That’s right – if you’re a parent, the single most common hazard to the continuing operational condition of your electronics is, in fact, the vivid imagination of a young child. Whether its marker outlines of Elmo on the television, playing a grilled cheese sandwich in the VCR, or using the DVD tray as a step stool, you can expect kids to come up with new and innovative ways of testing manufacturing durability. And the item most at risk of unexpected premature retirement? The ever-present remote control. Chances are you’re aware of the wide world of universal remote controls and the prices traditionally associated with quality products. You may even have felt that it’s safer to stick with the manufacturers’ original clickers – after all, remotes are used all the time, and one would be correct in assuming that touchscreens typically don’t fare well when introduced to a glass of apple juice. But what if one of those original controls suffers an unintentional “accident” and needs replacement. The cost of new original equipment remotes through the manufacturer is far higher than most folks anticipate. So what can be done to ensure that your remotes enjoy a long, productive existence? Why, introduce a decoy, of course. Several years ago, new company Fobis Technologies saw a need in the marketplace for a television remote control that could not only simplify technology for young children, but also bring peace of mind to parents concerned over their child’s viewing habits. 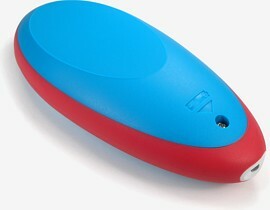 The result of that brainstorm was the “Weemote” (read our review), an inexpensive, brightly-colored and durable remote with three main attributes that give it family appeal. First, it’s simple in design, with only a few, uniquely shaped buttons that promote easy recognition and use. Second, it’s something that kids can truly call their own – it offers complete independence, allowing children to effortlessly turn the television on and flip back and forth between Barney and Sesame Street. Third, it actually gives parents peace of mind by allowing them to specifically choose which channels can be viewed. It has even proven to be the perfect decoy remote, keeping grabby hands away from those costly Home Theater Master and Pronto products. Sure enough the Weemote became a success, resulting in further development that culminated in the release of Weemote 2 and Weemote 3 models, each offering additional features over its predecessor. There’s even a specialized Weemote Sr. version, created for use by the elderly. It’s been nearly two years since we last heard from Fobis Technologies, so it was a pleasant surprise when we were informed that a fifth member was at long last being welcomed into the Weemote family: the $19.95 USD MSRP Weemote dV. This latest Weemote is not only intended for a completely different purpose than previous models, but also marks the first time the case has been completely redesigned. Let’s see what’s new!